The simple design of corrugated storm panels is strong and economical. Some common types are available in 24 gauge galvanized steel, .050” aluminum, or clear Lexan plastic and can be directly mounted or track mounted. The simplicity combined with rugged construction materials mean that Shutter Outlet storm panels are an economical storm and security solution. Compared to traditional plywood boards, which take much valuable storm preparation time to purchase (when available), fabricate, and fasten to the building. Plywood board installations are frequently installed improperly at the last minute only to become flying missiles as they tear away creating added hazard. Broken windows expose homes to internal pressurization from hurricane force winds causing roofs to explode and walls to collapse. Then after the storm when the plywood boards are uninstalled they become a storage problem and are often discarded. Storm panels, on the other hand, deploy in minutes, stay in place during the storm and store away neatly when not in use. 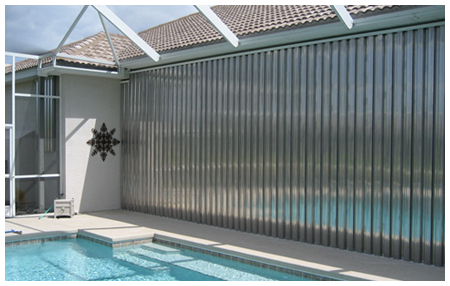 Aluminum panels are lightweight yet strong so installation and storage are a snap. Lexan plastic panels allow ambient light to pass through which means your home will not be as dark while the panels are protecting your home.